You're gonna need this APC on exomoon LV-426! Vehicle based on the 1986 sci-fi horror movie Aliens. Features movable parts like doors, seats, and hatch covers! Luminous top and front lights and monitors! Holds up to 12 Colonial Marine 1:18 scale figures. Includes one. 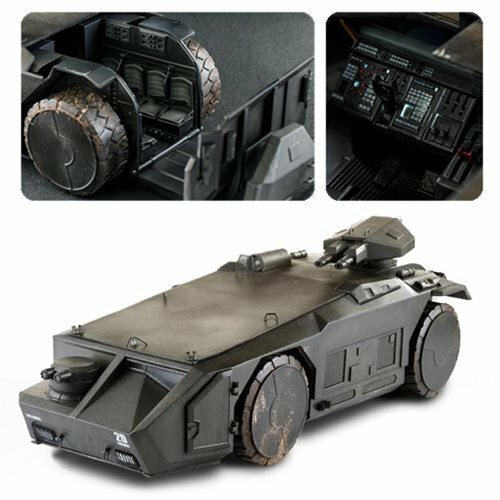 Hiya Toys presents this Previews Exclusive Aliens Colonial Marines APC 1:18 Scale Vehicle based on the 1986 sci-fi horror movie Aliens. Designed to hold up to 12 Colonial Marine 1:18 scale figures (sold separately), the highly detailed vehicle features LED and electronic components along with movable parts like doors, seats, and hatch covers. Made from PVC and ABS, it measures approximately 7 3/4-inches long x 7-inches tall x 6-inches wide and comes with a bonus 1:18 scale figure!